Americans celebrate Franklin D. Roosevelt as the president who led them out of the Great Depression of the 1930s and through the greatest global conflict in history. He ranks alongside Washington, Jefferson, and Lincoln as an architect of dramatic change in his own society. For all his famous informality of manner, he was perhaps the most regal leader the United States has ever had, reveling in the exercise of executive power. Throughout his political career, he showed himself undaunted by any challenge. 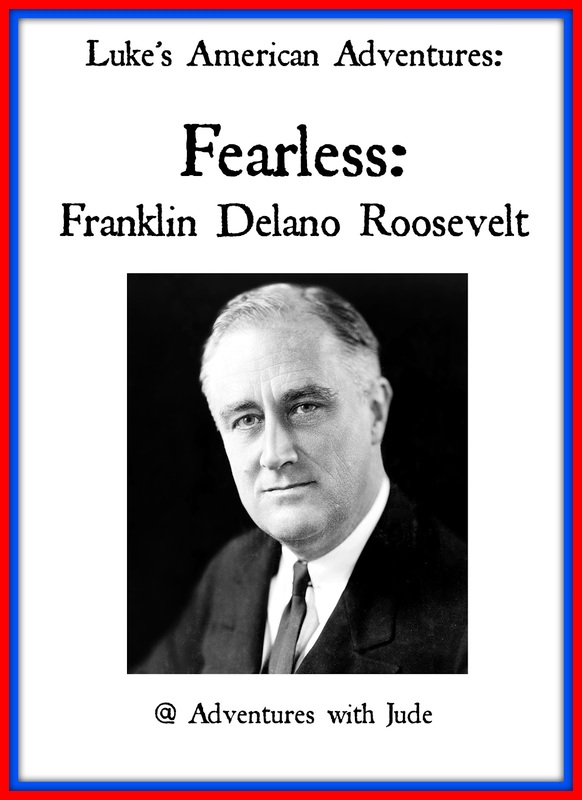 Through his concrete tenacity, suffering Americans found hope as FDR promised prompt, vigorous action, and asserted in his Inaugural Address, "The only thing we have to fear is fear itself." Following the example of his cousin whom he greatly admired, President Theodore Roosevelt, Franklin D. Roosevelt entered public service through politics. Unlike his distant cousin, however, Franklin took a risk, and ran as a Democrat in a district that had voted Republican for the past 32 years. 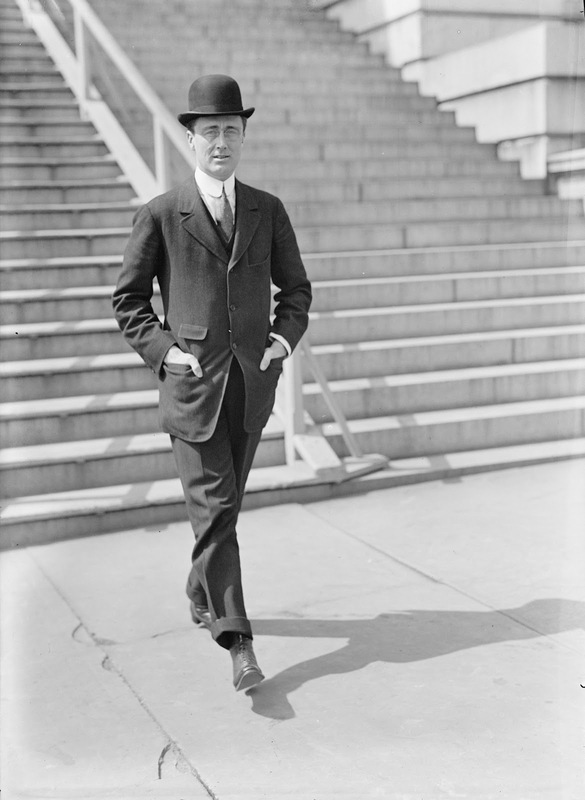 He won election to the New York Senate in 1910. In 1913, President Wilson appointed him Assistant Secretary of the Navy, and he was the Democratic nominee for Vice President in 1920. However, in the summer of 1921, when Roosevelt was 39, disaster struck. He was stricken with the poliomyelitis virus, which paralyzed him from his waist downward. However, he was not about to let Polio stop him from walking forward in life. Demonstrating indomitable courage, he fought to regain the use of his legs, particularly through swimming. At the 1924 Democratic Convention, he dramatically appeared on crutches to nominate Alfred E. Smith as "the Happy Warrior." While Roosevelt never fully regained control over his lower body, he eventually had built enough strength to appear to “walking” across a stage. In reality, however, it was all an illusion. He wasn’t actually walking; he was merely shifting his weight between a nearby arm or shoulder (often a close family member or friend who knew of the illusion) and a cane, and dragging his legs across the floor. By alternating a leading hip, it gave the appearance that not only had he survived polio, but he had overcome the paralysis. In time, the public came to idolize him as a man who could conquer the impossible. As a result, in 1928 Roosevelt became Governor of New York, and, during his second term as governor, was nominated for and elected as the nation’s 32nd president in 1932. American citizens initially elected Roosevelt president in 1932 because they believed he could combat the Depression more effectively than his Republican opponent, Republican President Herbert Hoover. FDR presenting one of his famed "fireside chats"
With the country mired in the depths of the Great Depression, Roosevelt immediately acted to restore public confidence, proclaiming a bank holiday and speaking directly to the public in a series of radio broadcasts, or “fireside chats.” Roosevelt also promised a "New Deal" that would lift the nation out of despair by implementing a variety of innovative policies. While the best known is the Works Progress Administration (WPA), it is not the sole innovation. In addition to the Agricultural Adjustment Act, the Tennessee Valley Authority Act, and the National Industrial Recovery Act, Roosevelt had won passage of 12 other major laws, including the Glass-Steagall Banking Bill and the Home Owners’ Loan Act, in his first 100 days in office alone! 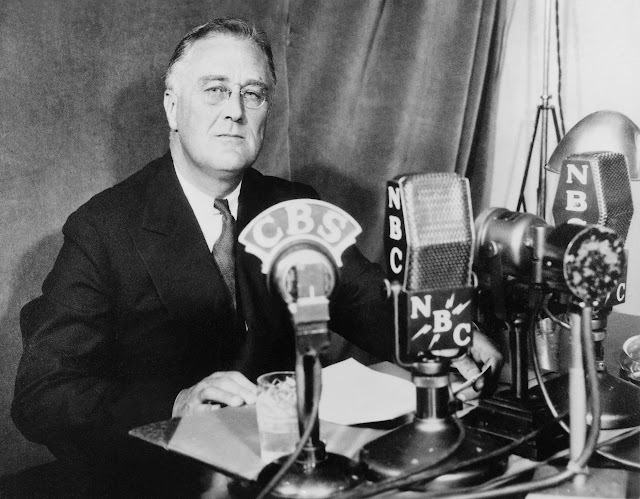 FDR was able to pull the United States away from the brink of economic, social, and perhaps even political disaster, and lay the foundation for future stability and prosperity. Unfortunately, this train of advancements was soon derailed. By 1938, negative publicity, a continuing sluggish economy, and Republican victories in midterm elections virtually ended Roosevelt's ability to further pass reform legislation. 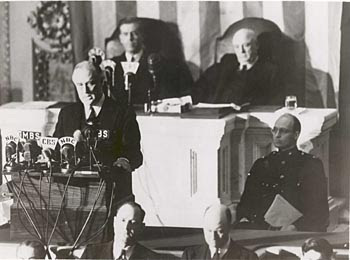 Early in 1940, Roosevelt had not publicly announced that he would break tradition and run for a third term as president. But privately, with Germany's victories in Europe and Japan's growing dominance in Asia, he felt that only he had the experience and skills to lead America in such trying times. At the Democratic National Convention in Chicago, Roosevelt swept aside all challengers and received the nomination. In November 1940, he won an unprecedented third term, defeating Republican Wendell Willkie. During 1941, Roosevelt pushed to have the United States' factories become an "arsenal of democracy" for the Allies—France, Britain, and Russia. As Americans learned more about the war's atrocities, isolationist sentiment diminished. Roosevelt took advantage, standing firm against the Axis Powers of Germany, Italy, and Japan. Bipartisan support in Congress expanded the Army and Navy and increased the flow of supplies to the Allies. While Roosevelt intended to only financially support the war, hopes of keeping able-body citizens out of combat ended on December 7, 1941, when the Japanese bombed Pearl Harbor. The following day, Roosevelt notably labeled December 7th as “a day which will live in infamy”, and proceeded to officially declare war on the Axis powers. During World War II, Roosevelt was a commander-in-chief who worked with, and sometimes around, his military advisers. He helped develop a strategy for defeating Germany in Europe through a series of invasions, first in North Africa in November 1942, then Sicily and Italy in 1943, followed by the D-Day invasion of Europe in 1944, while Allied forces rolled back Japan in Asia and the eastern Pacific. During this time, Roosevelt also promoted the formation of the United Nations. The stress of war, however, began to take its toll on FDR. In March 1944, hospital tests indicated he had atherosclerosis, coronary artery disease, and congestive heart failure. In spite of this, and because the country was deeply involved in war, there was no question that Roosevelt would run for another term as president. He selected Missouri Senator Harry S. Truman as his running mate, and together they defeated Republican candidate Thomas E. Dewey, carrying 36 of the 48 states. In February 1945, Roosevelt attended the Yalta Conference with British Prime Minister Winston Churchill and Soviet General Secretary Joseph Stalin to discuss post-war reorganization. He then returned to the United States and the sanctuary of Warm Springs, Georgia. On the afternoon of April 12, 1945, Roosevelt suffered a massive cerebral hemorrhage and died. At his side were two cousins, Laura Delano and Margaret Suckley, and close friend Lucy Mercer Rutherfurd. 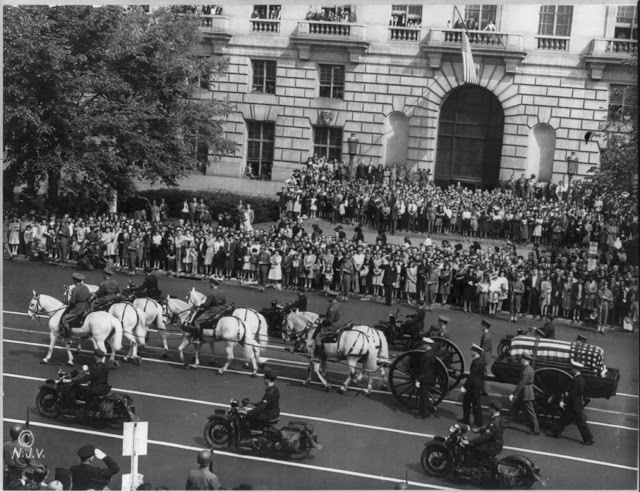 Franklin Roosevelt's sudden death shook the American public to its core. Though many had noticed that he looked exhausted in photographs and newsreels, no one was prepared for his passing. He had given people hope when they had none, and they now found themselves again adrift. In his twelve years as President, his contributions revised American society further than any of his White house predecessors save Abraham Lincoln. His social programs during the Great Depression redefined the role of government in Americans' lives, and his role during World War II established the United States' leadership on the world stage. By the time he left office, he had overcome as monumental a political hurdle as his personal one, raising the economically depressed United States into a superpower, capable of and willing to exert its influence around the globe. His seemingly fearless responses to the challenges he faced, both personal and political, have made him a defining figure in American history.